Quick review of the second book (of 4) that I won from Love Inspired's Historical line. Bear in mind that I'm not a huge romance reader and am not the target audience. So what drew me to this novel? Honestly, the cover put it at the bottom of my list. Man and woman having a picnic? "Can his love heal her heart?" Yeah, no. The art is pretty, don't get me wrong, but....no. Fortunately, the book itself has a lot more action than the cover would lead you to believe. OK, OK, a well-played game of golf has a lot more action than the cover would lead you to believe. 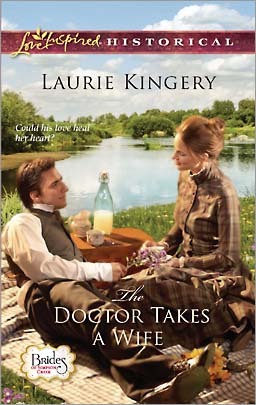 I actually was interested to read it when I saw this guest blog series that Laurie Kingery (ER nurse and author!) wrote about 1860s medicine. Good read! And I wouldn't really consider the entries massive spoilers, either. Why did the new doctor in Simpson Creek have to be a Yankee? Sarah Matthews can see that Nolan Walker is a good man—and a handsome one. But she can't return his affection. Not with so much bitterness from the war fresh in her memory. Yet when the town is struck by a deadly influenza epidemic, it's Nolan who battles to save Sarah's life. And when a shadow from the past returns, the time arrives for Sarah to decide if she's finally ready to utter the words her doctor longs to hear—"I do." This is actually the second in a series. You don't need to read the first book to follow this one (I didn't), though some of the characters were a bit confusing to me. *Nolan was fairly engaging. He was smarter than most doctors of the period (i.e. more successful, doing things that modern doctors take for granted like washing his hands). Sarah was fairly likable. I definitely liked it best when she was being so pigheaded and hating him. For the plot I know she had to come to like him fairly early on, but I wish she could've gone on hating him a while longer. Too fun! *The ending really took me by surprise, in that the rest of the book strikes me as almost X-TREME Anne of Green Gables series (influenza epidemic; parentage scandals)...and then.... Well, from reading the back cover and the first couple chapters, you can probably guess who or what the "shadow from the past" is, but I was really surprised at the turns it took. It wasn't BAD, but I would've liked it better if I had been expecting it to be that kind of book. Given Nolan's past as a Civil War doctor it does make sense that he could rise to the occasion if needed, but a big part of me was wondering why these small-town characters were being put through all of this. *The last paragraph made me laugh out loud in a "how sweet" way. I do get kind of lost when I'm reading a book and there are a kajillion characters (might come from being an introvert). But a lot of characters seems to be the sign of a well-thought-out small town! So it's not exactly my style. I still found it fairly enjoyable, though. I kind of wish there hadn't been as much action in the end. It sounds like the first book also ended with a lot of action...might be interesting to see how the subsequent books are. Not that there wasn't violence out there, mind you, but still...even with the post-Civil War talk, I was surprised! *FTC disclosure--I WON this book and didn't pay a thing for it, not even shipping. Though I still try not to pull my punches. I enjoyed your review. I'm not a fan of Romance fiction either but it looks like you did it justice!